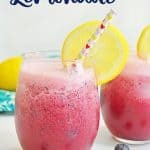 This Easy Blueberry Lemonade recipe is the perfect blend of fresh blueberries, lemons, and sugar for an easy and refreshing summer drink you’ll want to make again and again! Combine all ingredients in a blender and blend. Serve garnished with lemon slices and extra blueberries. Fun option – replace half the water with sparkling water or club soda for a sparkling blueberry lemonade version.